Musicology studies music in all its diversity – how and for whom music is performed, how it affects and influences people and what makes music important to its listeners. These are only some of the questions musicologists explore. EAMT is the only university in Estonia that teaches musicology. All the most important fields of musicology are represented in the curriculum: history of music, music theory, ethnomusicology and cognitive musicology. Both contemporary and historical music is studied, and alongside classical music history, there are different national, popular and film music courses. Estonian music culture is viewed as a part of a wider cultural practice and is compared to practices in other countries. In addition to research based studies, the curriculum offers several opportunities to explore training in the field, including professional practice in radio, museum and editing. 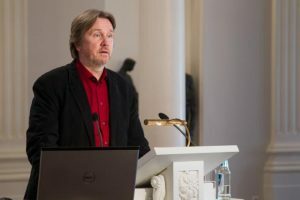 Among the faculty members are internationally renowned researchers involved in different research projects both in Estonia and elsewhere, such as Kristel Pappel, Mart Humal, Jaan Ross and head of studies Toomas Siitan. Every semester, there is at least one intensive seminar led by an eminent visiting professor or researcher, where an actual research topic is addressed in depth. Students receive regular individual feedback from the professors. Graduates of musicology work as editors, teachers or lecturers and researchers for several media publications, institutions of education and research, archives, concert organisations, broadcast organisations and elsewhere. Students interested in thinking about music and researching it systematically, as well as sharing their findings with others, are welcome to study at EAMT.